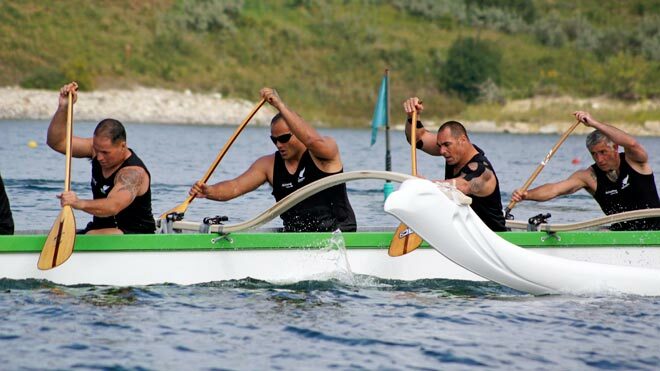 The black-clad Kiwi men’s team powers through the water at the 15th world Va’a (Outrigger) Sprint Championships, held in Calgary, Canada, in August 2012. More than 1,000 paddlers from 18 countries took part, and seven First Nation chiefs opened the tournament. The final medal count showed NZ and Hawaii tied for first with 61 each. New Zealand women’s teams took all medals in several events. The 2014 world championships are being held in Rio de Janeiro, Brazil.